A new report by Persistence Market Research offers an eight year forecast for the global oregano essential oil market. The primary objective of the report is to offer insights on the advancements and opportunities likely to emerge in the oregano essential oil market. The study demonstrates market dynamics that are expected to influence the current challenges and future status of the global oregano essential oil market over the forecast period. This report also offers updates on the trends, drivers, restraints, value forecasts, and opportunities for manufacturers operating in the various regional oregano essential oil markets. In the final section of the report, a competitive landscape has been included to provide report audiences with a dashboard view. Categories of providers covered in the report include key players operating in the global oregano essential oil market. Detailed profiles of the providers are also included in the scope of the report to evaluate their long-term and short-term strategies, key offerings and recent developments in the oregano essential oil market. Given the ever-fluctuating nature of the global economy, the report not only conducts forecasts in terms of CAGR, but also analyzes the global market on the basis of key parameters such as year-on-year (Y-o-Y) growth to understand the predictability of the market and to identify the right opportunities. Also, another key feature of this report is the analysis of all key segments in terms of absolute dollar. This is traditionally overlooked while forecasting the market. However, absolute dollar opportunity is critical in assessing the level of opportunity that a provider can look to achieve, as well as to identify potential resources from a sales and delivery perspective in the global oregano essential oil market. The oregano essential oil market is highly centered in the regions of Europe and North America, predominantly owing to the use of this spice in specialty cuisines preferred by the Americans and Europeans. Increasing awareness of the health benefits of oregano essential oil is pushing people to adopt this oil in their daily food preparations. This factor is boosting consumption levels across North America and Europe and is the primary revenue booster of the global market for oregano essential oil. Manufacturers are pumping in huge investments in research and development activities to expand the functionality of oregano essential oil across various food products and are also launching newer blends in the global market in keeping with rising consumer preferences. The rise in demand for natural preservatives by the food and beverages industry is bolstering demand for oregano essential oil globally. The essential oil and aromatherapy market is estimated to record a higher growth rate due to the high awareness about the healing properties of essential oils and oils used for aromatherapy among consumers. The applications of essential oils in aromatherapy is increasing in the medical field, thereby boosting demand for these oils in the global healthcare and pharmaceuticals sector. Oregano oil is the most important antiseptic oil in aromatherapy. Its proportion of phenol – the constituent responsible for the strongest antibacterial action – is the highest of all aromatic plants. The demand for oregano essential oil in the pharmaceuticals industry across various regions has witnessed a surge in the last few years and this demand wave is expected to continue during the forecast period. In the recent past, manufacturers in the F&B industry have been incorporating natural preservatives such as essential oils for the preservation of processed food. This can be attributed to the rising demand for natural products by consumers. Carvacrol and thymol are the two main components used in oregano essential oil that are responsible for the characteristic odor and antimicrobial and antioxidant properties of the oil. Being an antimicrobial agent, oregano essential oil acts as a beneficial preservative agent in the food industry. The prices of oregano essential oil are highly volatile, owing to a demand-supply imbalance in the global market. This price volatility creates inconvenience for manufacturers as they struggle to optimize the final product pricing and sustain their profit margins at the same time. Furthermore, as essential oils like oregano are quite expensive, certain manufacturers of perfumes are forced to reduce the costs of their formulations and resort to cheaper ingredients such as low-cost natural oils or synthetic oils, which serve as substitutes for expensive essential oils. Price constraints are a major roadblock in the sustained growth of the global essential oil market – more specifically oregano essential oil. Of all the regional markets, MEA and Latin America are expected to lag behind in terms of consumption of oregano essential oil during the forecast period. 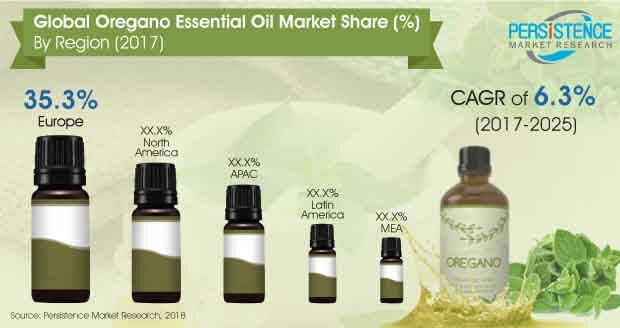 Europe followed by North America will continue to dominate the global market for oregano essential oil in terms of consumption and sales revenue. A strong consumer base for oregano essential oil is already present across the F&B and cosmetics industries in these two regions, leading to increased utilization of this oil and subsequently a higher market share. End-use industries in the Asia Pacific are anticipated to project moderate to low demand for oregano essential oil in the coming years.